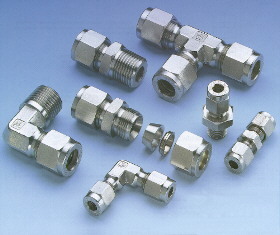 Waverley brownall offer one of the widest ranges of twin ferrule stainless steel tube fittings in the World. 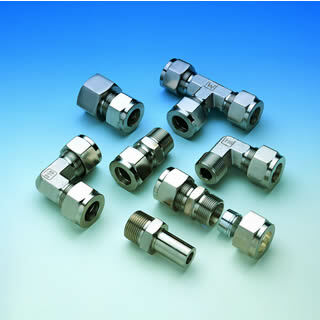 The Ringlok twin ferrule fittings were developed to satisfy the stringent needs of the oil, gas, petrochemical, refining, power and general process/instrumentation industries. The range provides optimum performance and value in the connection of tubes for high pressure or vacuum; elevated or cryogenic temperatures; vibration and impulse loading; corrosive or hazardous environments and media. Ringlok twin ferrule OD compression tube fittings are available in a full range of metric and imperial sizes and thread forms. They are manufactured and stocked in stainless steel, Monel 400 alloy and a large range of other exotic materials including Incoloy and Inconel. Duoloc single ferrule OD compression tube fittings are designed to be robust, yet quick and easy to assemble and have been extensively used for onshore applications for over 35 years. These include instrumentation for gas control systems, gas R&D systems, process control for chemical plant and general hydraulic industries. The fittings are resistent to vibration, providing ease of assembly (controlled bite), break and remake facility and offer full material cast code traceability. The Duoloc product is available in stainless steel and a comprehensive range of metric and imperial sizes and thread forms. Most Duoloc fittings can be adapted to work with glass or PVC tube and can be modified to suit thermocoupling applications. The Duoloc product is produced within the control systems approved by BSEN ISO 9001, and in accordance with BS4368.